Well, it’s been a while since I wrote anything here – mainly because we’ve been so busy! Which makes it all the harder to have to tell you that we will be closing our doors in July. Things will carry on as normal to the end of June, then we will clear the stock and furniture during July, staying open as long as we can. This is mainly because I cannot carry on running the business on my own – I have some excellent volunteers who offer regular, brilliant practical help, but the strain of running the business alone and not making enough money to pay myself a wage has taken its toll. But I would still like to fill you in on the last few weeks, and tell you about our lovely week-long Shakespeare Festival, which despite low numbers for some events was wonderful – two truly excellent talks, Elizabethan dance classes for all ages, fabulous drama workshop for children drawing on A Midsummer Night’s Dream and four stunning films, each one very different. It was particularly lovely to end the festival with Kenneth Branagh’s Much Ado About Nothing, as Ken has done so much to refresh our understanding of Shakespeare’s plays and his language; on a personal note, it was seeing him in the very same play in the West End in about 1990, opposite Samantha Bond as Beatrice, that showed me how Shakespeare’s extraordinary language could be at once completely natural and sublimely poetic. The man is a genius. (Ken, I mean, though obviously Shakespeare is too.) The night before we had watched Throne of Blood, Akira Kurosawa’s incredible retelling of Macbeth transposed to medieval Japan, a film of great beauty as well as power; earlier in the week, Baz Luhrmann’s Romeo + Juliet. The three films together scratch the surface of the universality of Shakespeare’s brilliance (the fourth film was Shakespeare in Love, hugely enjoyable and wittier than I remember, despite having to cope with Gwyneth Paltrow, but the adaptations of the plays were much more rewarding). Midweek, Thomasin Bailey had explored how even Shakespeare’s seemingly outdated view of women is still something that can illuminate our own thinking about the world we live in today. This talk – the best attended event of the week – also showed the desire locally for events such as this: a discussion of around 45 minutes followed the talk, with questions and comments from a clearly engaged and knowledgeable audience lapping up the opportunity to have such a discussion. The wondrous Vicki Mansfield, volunteer extraordinaire and main organiser of the Shakespeare Festival. She made the dress herself – 20 years ago! The following week we had one of my favourite events since the Tree House opened. Michael Burdett, a composer based in London, had noticed me retweeting his tweets about his Strange Face Project: adventures with a lost Nick Drake recording, and called into the shop one day to chat about the possibility of giving a talk based around the project. 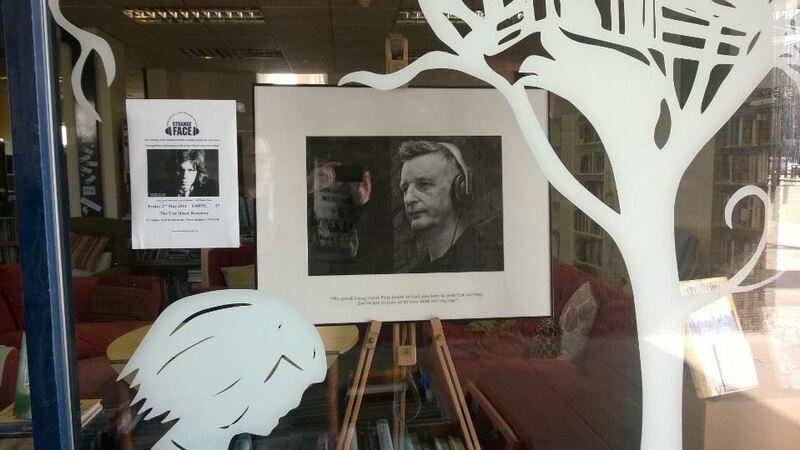 Some of you may have seen the Billy Bragg photograph he lent us, which was displayed in the shop window to advertise the event; only ten people came, but it was a fabulous evening, the combination of Nick Drake’s genius (that word again) and Michael’s warmth, wit and fund of great stories. It’s a shame there were not three times as many people, but I hope he has a bigger audience when he now takes the talk to the Edinburgh Festival! The Tree House heard it first. And we thus followed a week celebrating Warwickshire’s greatest son with a celebration of another Warwickshire genius, the matchless Nick Drake. We have also had two fabulous live music events, a couple of days apart – Inlay and Jez Hellard and the Djukella Orchestra were two quite different bands, but united in their folk-based roots and brilliant musicianship. They were also delightful company, all of them – two wonderful evenings. We have something happening most evenings, which is partly what makes it unsustainable for me; but our events have been poorly attended, with a couple of exceptions, and that’s a shame – we’ve had some wonderful things at very reasonable ticket prices. 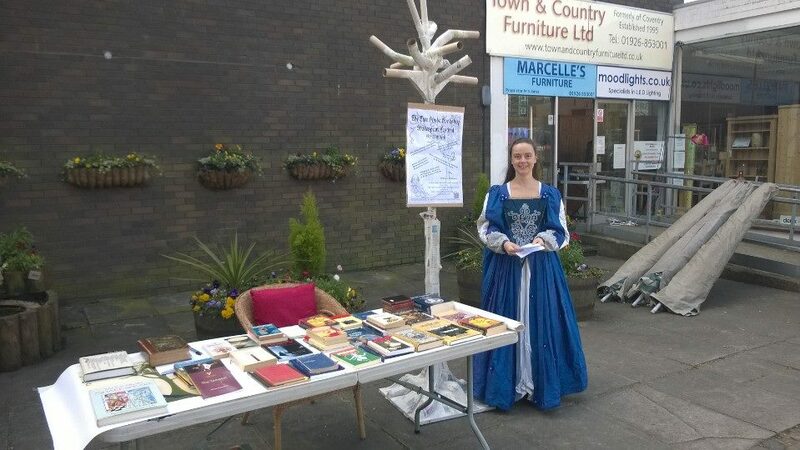 The books have been selling very well, though – we have had, and continue to have, amazingly generous donations from many people, and have some really good stock, which is being appreciated, clearly, by booklovers in and near the town. The chief purpose of the shop is to promote the importance of books and literature, and we still have plenty of work to do on that front, but the bookshop side of things has been very successful. Just not enough on its own to pay anything beyond rent, rates and bills, which add up to around £1600 a month. But the best thing about the Tree House has been the people. We have a core of regulars who call in frequently for a cup of tea and a chat, or to spend a few hours sorting and shelving books, and who have got to know each other and helped to create a real sense of community. Others who come in weekly to see what new stock is on the shelves. Others still who make a one-off visit and express their enjoyment of their visit. So many people seem to love the place. So it is sad to reach the point where I have to give up. I have been thinking it might be possible to continue, but the reality is that with things as they are at the moment, it’s not possible to go on. I am not a natural businesswoman, and have had some serious personal setbacks in terms of the creative input into the venture, and the combination of these things has ultimately led me to this decision. I can’t continue indefinitely without some sort of income. If there is a philanthropist out there who would like to inject some cash (so that we could employ a bookkeeper, for a start! ), or anyone who can offer voluntary business expertise (in terms of the financial and legal stuff mostly), we’d love to hear from you by the end of June! If we really do close, which looks more than likely, I am making plans for ways to continue some of the spirit and achievements of the Tree House without fixed premises. But I do also need to get my life back! This evening we start our weekly volunteers’ drop-in sessions, from 5-7pm – if you fancy lending a hand with whatever needs doing, just call in for as long (or as short) as you like. 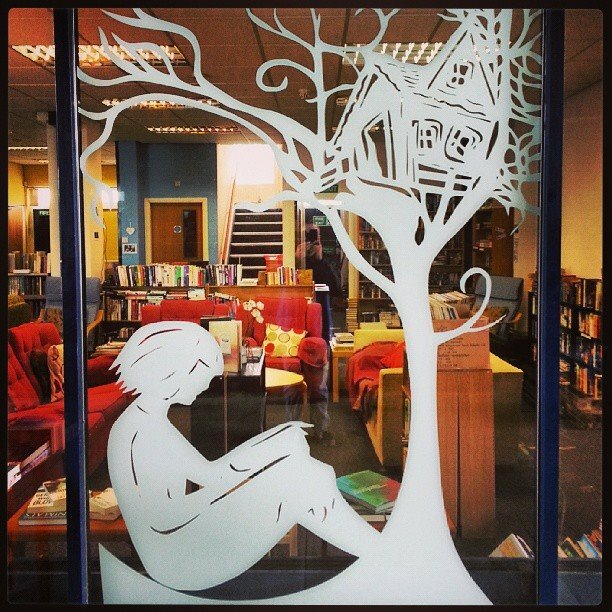 We will be mostly tidying shelves, sorting books, washing up, preparing for our children’s bookstall tomorrow – it’s all much more fun with a group of people. Then we have T’ai Chi and Nifty Needles, both of which start at 7pm – T’ai Chi on one side of the room, people knitting, crocheting, embroidering and plumping cushions on the other side – surreal but it works! 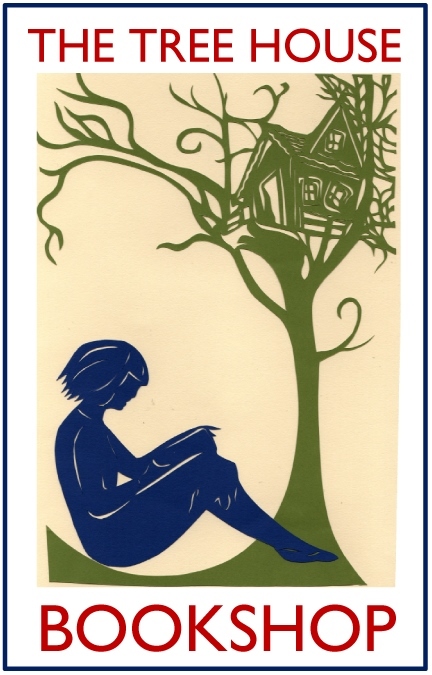 Tomorrow morning we have a bookstall for children, as it’s half term – if it’s dry, we’ll be outside Town & Country Furniture, if it’s wet or very cold we will be inside the Tree House. There will be a few things for grown-ups too! Saturday evening sees the first of our Saturday evening films as part of our film club – Finnish drama The Man Without a Past (7.30pm, doors 7pm). Sunday afternoon’s treat is the fabulous Brief Encounter (3pm, doors 2.30pm). £5 including annual subscription to the film club, £3 for members, £2 for members who are Friends of the Tree House. Refreshments included. Saturday March 8th is the date for a talk and booksigning by Greta Berlin, a long term activist on behalf of the Palestinians in Gaza. 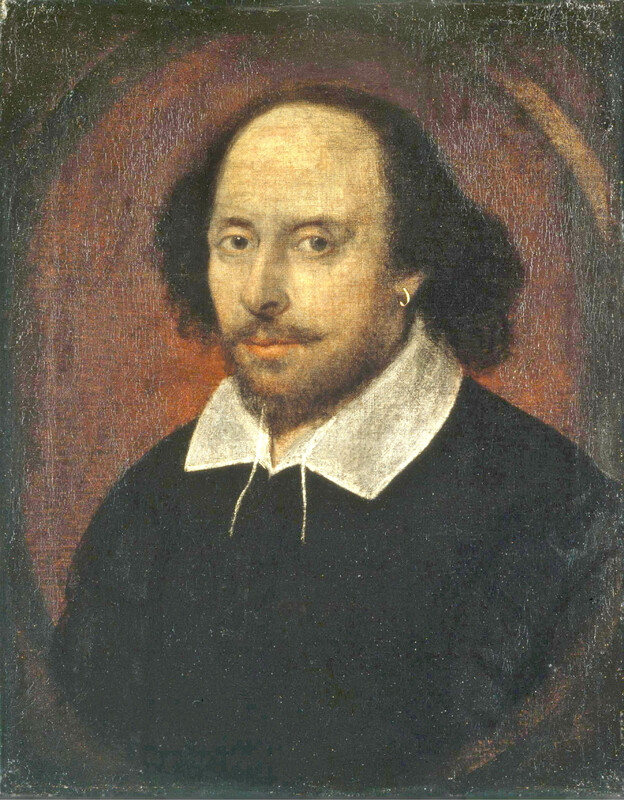 We are planning a Shakespeare festival in April; we wanted to mark the great man’s birthday anyway, but as it’s his 450th we decided to run a week long series of events from 19th-27th April, including talks, films, performances, Elizabethan dancing, children’s workshops. There is a Facebook page for the festival, and I will of course update you here as to what’s happening. Don’t forget our regular Wednesday afternoon therapy sessions – Reflexology and Shiatsu. You can book full sessions or 20-minute tasters – you can also call in on the off-chance if you are out and about on Wednesday afternoons. Reflexology 12-3, Shiatsu 12-5. We have also been running a course on mindfulness on Monday evenings, which has been wonderful. Vicky Lindsay, who runs it, is planning another course when this one ends – a taster session then another run of the 8-week course, so look out for updates on that – I would heartily recommend it to anyone. Today is Charles Dickens’ birthday (b.1812). One of the things I need to do more in the bookshop is celebrate literature! One of the things that seems to get lost in all the furore of trying to make ends meet is the purpose of having a bookshop at all – to promote, enjoy, share, explore and honour the literary creative process and its importance to civilisation. As a small gesture towards promoting one of our very greatest novelists – our greatest? – anyone who buys a novel by Dickens today can choose another novel up to the value of £2 free. In other news – I have decided that for the next few weeks the Film Club will meet on Sunday afternoons only. Attendance on Thursday evenings has been very low, and with the weather persisting in its evil ways I think it might be better to establish the Sunday afternoon films and wait until the evenings are a bit more inviting before attempting a regular weekday evening screening. We may still have the occasional film! And the selection of films on Sundays may broaden slightly, though the emphasis will still be on classics or gentler films – with the odd challenge thrown in! We now have a little pile of books wrapped in brown paper with a nice red ribbon – the start of our ‘blind date with a novel’ feature. I have chosen a few paperback novels to wrap, and written a few words on the paper to give a very general indication of the kind of book hidden within. For those times when you can’t decide what to read, or are in the mood for a surprise or a literary adventure. A bit of fun, great for a wet weekend! In the pipeline: more music, with some excellent local bands keen to come and play as well as those from further afield, some more storytelling, some adventures with exotic animals, and a week of celebrations for Shakespeare‘s birthday in April. And more! I will take a break from Tree House related news to post in honour of William Shakespeare, whose birthday is celebrated today. We don’t know that he was actually born on this day; we have his baptism date recorded (26 April 1564), and we know that the date of his death was 23 April, and the birth date of 23 April goes back to the 18th century; whether it was given because it also happens to be St George’s day as well as the date of his death seems plausible, but who really cares – today is a day to celebrate the greatest writer in the English language (and surely one of the greatest writers in any language), who is also a local hero – born and bred in Warwickshire, even if he did spend much of his adult life producing plays in London. Kenilworth shares in the celebrations of its near-neighbour Stratford-upon-Avon in paying homage to this local literary hero. I know a lot of the stories to his plays are a bit silly; this is also true of opera, which has produced some of the most sublime music of all. In both cases, the stories are a vehicle – in Shakespeare’s case, a vehicle to explore the human condition (he was born in the year that Michelangelo died, into a Renaissance culture obsessed with studying man and his place in the cosmos) and to explore, develop, enjoy, alchemise (it may not be a word but I don’t care!) the English language. That we still use countless phrases from Shakespeare in everyday speech shows something of the power of this language – it’s beautiful but it’s profoundly meaningful. Growing up near Stratford, I was lucky to see several plays by the RSC. I have wonderful memories of a young Patrick Stewart virtually naked as Oberon (not something I’m likely to forget! ), to a Titania I can’t remember but whose gossamer cloak filled the stage. Of Ben Kingsley as Brutus when we were studying Julius Caesar for O Level, and being told to take note of him as he was an actor tipped for stardom (this was 1979 or 80) – I later saw him as Othello too. Of Derek Jacobi as Prospero in a Tempest that also incluced Mark Rylance, Alice Krige, Bob Peck and Michael Maloney in a visually stunning representation. My one regret is not having seen Kenneth Branagh’s hugely acclaimed performance as Henry V at the age of 23, the part that made his name. I always love going there, and while they produce plays by other playwrights too (modern as well as Early Modern), it is Shakespeare who still thrills the most. Lately they have been doing lots of interesting things, including commissioning music from contemporary musicians – Jon Boden has provided music for The Winter’s Tale, Laura Marling for As You Like It, in their most recent productions. They do a lot with schools and education – Warwick University now has a Masters degree for teachers specifically in teaching Shakespeare. We should be very, very proud of Shakespeare as a Warwickshire lad (and of that other literary luminary, George Eliot, also Warwickshire-born). We hear a lot about children forced to read his plays and not understanding them, I sometimes here contemporary actors dismissing him as too difficult to understand, but it just takes a little effort, a little time, a little patience, a little thought and concentration, and the rewards are vast. He was a genius, despite being a down to earth sort by all accounts, not a saint, not beyond criticism, but the greatest writer this country has produced. A writer who contained all the world in his plays, however far-fetched the stories sometimes seem, and in his poems, who gave us words to live by and words to think by, who understood humanity completely and had the ability control and create language to express the depths of what it is to be human. So happy birthday Will. The Tree House will celebrate his birthday every year, in much more concrete ways than this once we are better established. Were it not early in the day and me in need of breakfast, I would have peppered this post with Shakespearean phrases, that would have made it all a bit wittier. My catchphrase as I try to lose some weight is ‘Oh that this too too solid flesh would melt…’ – which may seem a trivial way to end a post about this great man, but just shows how his great language encapsulates very ordinary human issues and concerns! The Tree House needs will power if it is to come to reality, and Will power if it is to be all it truly can be. He can be our guiding spirit.